Inder Loves Folk Art: KCWC Prep. Next week is Elsie Marley's Kids' Clothes Week Challenge (KCWC)! I followed this challenge for the first time last October, and it was really fun. Basically, the idea is to sew clothes for your kids for an hour a day for seven days. The challenge is open ended, so of course some ambitious moms sew a lot more than that, and last time, I impressed myself with how much sewing I got done once I got into the groove. The all-day singing is a huge amount of fun, and it's also a huge amount of work. Although I did not take on any managerial responsibilities for this singing (I'm pleading "too pregnant"), all local singers are expected to cook a lot of food for the "dinner on the grounds" to ensure that our visitors have plenty to eat. So my housemate and fellow-singer Rebecca and I will be up late on Saturday night and early on Sunday morning getting all of our dishes ready for this wonderful part of our singing tradition (since the Sacred Harp really took root in the Southern U.S., our ideal is "Southern-style hospitality," which is to say, abundant to the point of burying your guests in food). And then we'll spend all day Sunday singing shape note hymns, chatting with our friends from near and far, and doing whatever needs to be done to keep everything running smoothly. As you can imagine, after one of these events, my usual course of action is to collapse into a giant heap of pathetic worthlessness on the couch and try to recover by watching bad television for several days. And that's when I'm not 27 weeks pregnant (oh, hi, third trimester! you already?). But whatever. I'm still going to give it a shot. If I don't quite sew an hour a day, well, I'll try to get a little bit done here and there. If I don't sew at all on Sunday night, I can always try to make up for it the following Saturday. Or not. No pressure. Onto my preparations! Although I am not writing a list of items to sew next week like some more ambitious bloggers are, Joe always needs pants, shorts, and t-shirts. He averages two full outfits a day (so many messes to be made!) so we are always desperately doing laundry just in order to keep him clothed. So I just downloaded two digital patterns that I am really excited about. First up, the Oliver + s Sandbox Pants in sizes 6 months to 3T. As you may remember, I sewed these up in size 4T for Joe pretty recently, and they turned out beautifully, but they are way too big, waaaaaah. It took a while for me to justify buying the smaller size, since Joe is currently 3T, but with a new little one on the way, I just know I'll get a ton of use from the smaller pattern. I just love the casual styling and details, and I think it is a perfect gender-neutral (and infinitely adaptable) pattern. Second, Made by Rae's Flashback Skinny Tee. 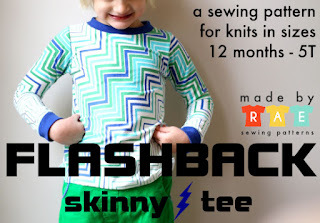 This t-shirt is currently exploding across the sewing-for-kids-blogosphere, and it's easy to see why. My kid wears t-shirts, well, every single day. Talk about practical! And I'm looking forward to continuing to work on my sewing-with-knits skills. I have a nice little pile of knits and ribbings set aside just for this project! But the best part about KCWC is not really the sewing, of course. It's seeing all of the amazing clothes that all of my fellow bloggers make. So that's the plan: Try to sew a little, maybe try out some new patterns and ideas, and generally kick back and enjoy the spectacle. I'm looking forward to it too - bring on tomorrow! Yahoo! Bring on the kid's sewing! I'm taking part too - can't wait. It's my first time taking part although I've looked on the last couple of times. I'm looking forward to seeing what you sew. I have a very long list of things I want to make and realistically won't finish them all but it'll be great to sew along with everyone. Like you, I tend to take my time with sewing, especially when there are a lot of details, etc. (And most of my favorite projects have lots of details!) So I don't expect to churn out a ton of clothing, but I am looking forward to spending a little time everyday sewing, and seeing what everyone else comes up with.